Good habits are hard to form. Before something becomes a habit that you don't have to think about, it's just a task that must be repeated over and over. The trouble is, good intentions only get you so far, which at least for me, is not very far at all. So how do you get from aspiration to execution? An app isn't going to magically make you eat better or wake up early to work on your next big project, but through a system of reminders and tracking, Streaks creates a sense of personal accountability that I find helps a lot. It is easy to see why Apple named Streaks one of the best apps of 2015. Streaks looks great, with a design language that is right at home with today's iOS, and is a great example of an app with a narrow focus, but deep, singular attention to detail. 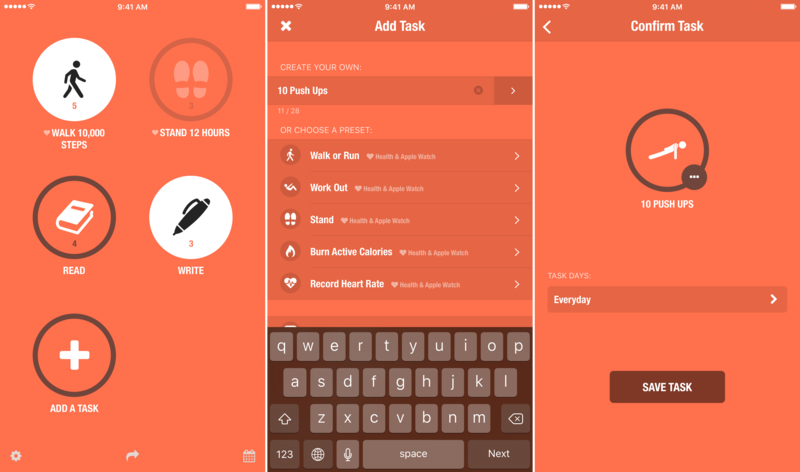 You can add tasks by tapping the 'Add A Task' button on Streaks' main screen or from within its settings. Streaks comes with fifteen built-in tasks to get you started, or you can add custom ones with their own unique icons. One touch I especially like is that Streaks suggests an icon from the hundreds in its database based on what you name your task. So, if I add something like '10 push ups,' Streaks will suggest a push ups icon. It's a small detail, but one that is unique and adds a little surprise and delight to a mundane task, while also making it a little easier to add a task. Streaks intelligently suggests an icon for custom tasks. Streaks limits you to just six tasks, which I quite like.1 It's an opinionated design choice to be sure, but the constraint is one that both simplifies Streaks and sets it apart from general purpose task managers. The limit emphasizes that Streaks is meant to help you focus on only a handful of new habits at a time. Once a task graduates to a habit, you can simply drop it from Streaks and add another if you choose. I think this is a realistic approach to forming new habits and appreciate that the philosophy is designed directly into Streaks. Streaks has highly customizable notifications. I can set frequent reminders at the outset of a new task and then dial them back as it starts to become a habit. Notifications is also an area where people have vastly different tolerances for interruptions, so offering granular control is smart. In Streaks' settings you can toggle a countdown of the number of incomplete tasks you have, which displays as a badge on the app's icon. Streaks' Apple Watch app includes a complication that provides similar feedback. You start the day with a series of greyed out circles for each of your tasks. When you finish a task its circle becomes white. The complication and iPhone app badge do not indicate which tasks you have finished – both are simply meant as task overviews. I'm picky about which apps I let badge icons on my phone and complication space is valuable real estate, so I do not use either of these notifications, but they provide glanceable feedback that others may find worthwhile. Streaks' other reminders are far more useful to me. At the top-most level you can set reminders to 'None', 'Single Daily Reminder' or 'Reminder for Each Task,' which do exactly what you would expect. I prefer to set reminders on a per-task basis. For each task you can set notifications to 'No Reminder,' 'Automatic Time,' where the app sets the time you receive a notification, or 'Custom Time,' where you set the time manually. I use custom reminders for tasks like "Read" that I can set for a time when I know I am most likely to have time to read. You can also toggle a notification for tasks tied to the Health app so you get a notification when you reach an automated goal like "Walk 10,000 steps." Marking tasks as finished is one of Streaks' greatest strengths. Streaks is not the kind of app in which you should spend a lot of time. I have enough things I track every day, so I appreciate that I can quickly mark a task as completed by long pressing the icon on Streaks' main screen, which draws a white the border around the task's circular button, changing its appearance so you know that the task has been completed. You can also mark yesterday's tasks as complete if you forget to do so and mark tasks as complete from the Watch app. 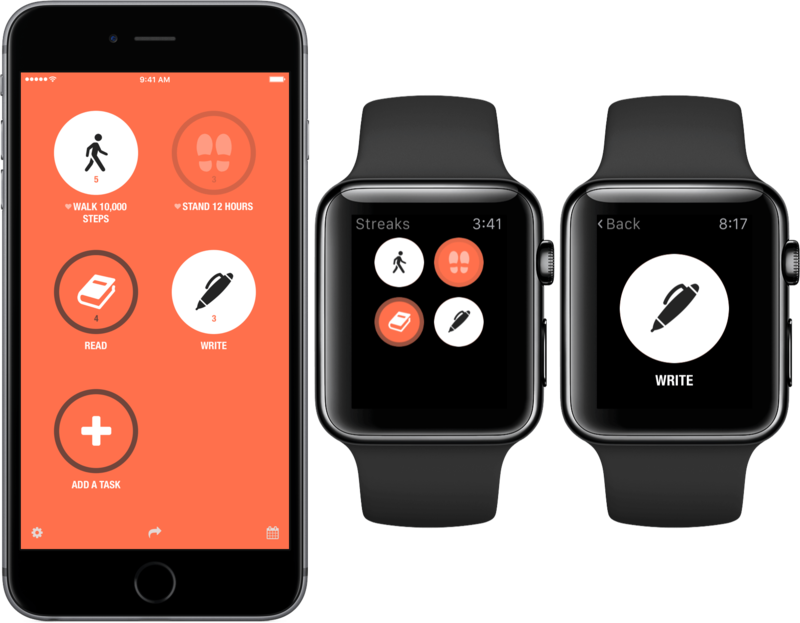 Streaks automatically marks tasks such as step counts that are tied to the Health app as completed when you reach your goal. If you have an iPhone 6s or 6s Plus, you can mark any of the first four tasks in your list as completed by pressing on Streaks' Home screen icon. It would be great if you could mark more tasks as completed this way, but the 3D Touch API limits developers to just four shortcuts, so it's best to arrange your goals so ones that can only be marked as completed manually occupy the first four slots on Streaks' main screen. 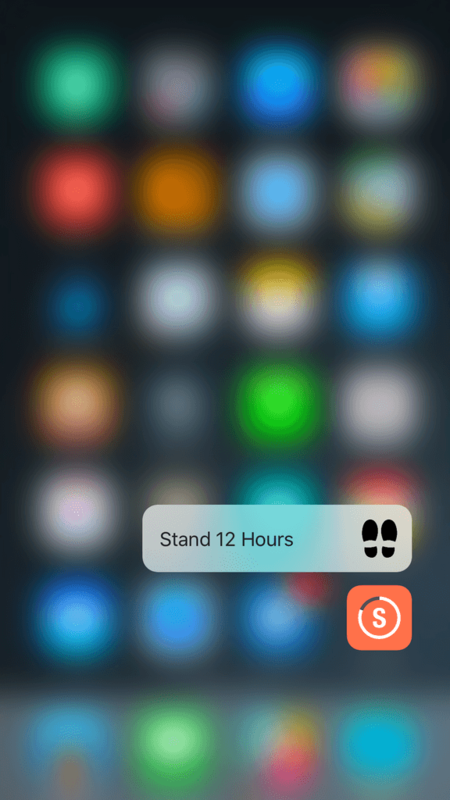 3D Touch the Streaks icon to complete tasks. Given Streaks' emphasis on accessing tasks quickly and marking them as completed, I would like to see an iPad version of Streaks. Granted, the design would have to be rethought to avoid a comically large version of the iPhone app or a vast sea of white space, but as someone trying to track tasks, the more platforms on which I can access my tasks, the better. 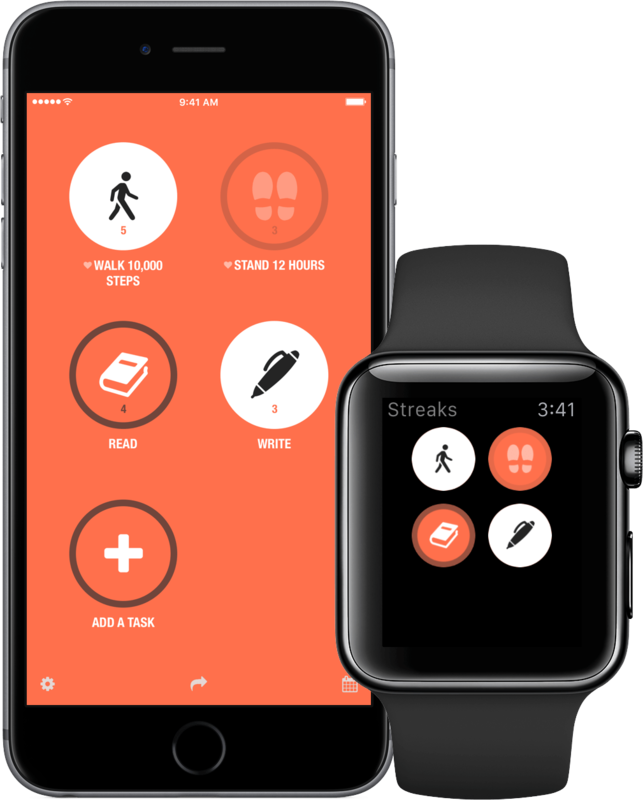 As its name implies, Streaks also tracks your progress over time. 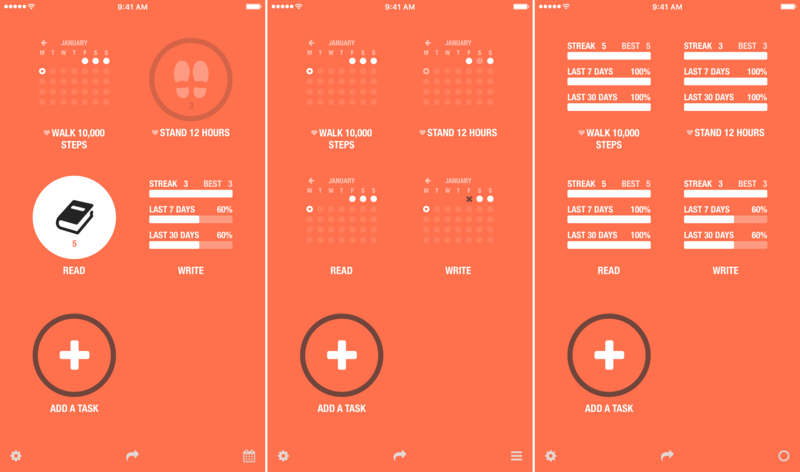 Daily progress is easily tracked on the app's main screen and Apple Watch app. On the iPhone app's main screen, you can quickly determine if you have completed a daily task by the button's appearance, which changes from a dark grey bordered circle with a white icon to a white circle with a black icon. There is a number beneath each icon, which is the length of your latest streak (i.e., the number of consecutive days you have completed a task). The Watch app also highlights completed tasks in white, but does not include streak statistics, which is an addition from which I think the Watch app could benefit. There are two ways to dig a little deeper into your progress. First, you can tap a task's button and Streaks will display a calendar of the current month with white circles on the days for which you have completed a task. Tap a task's button again to see additional statistics about your current and best streaks, as well as your performance over the last week and last 30 days. Second, you can tap the button in the lower right-hand corner of the main view to cycle through the same statistics, but for all of your tasks at once. Digging deeper into the data. Streaks helps keep me accountable to myself for habits I am trying to form without making the process any harder than it already is. Interactions with the app are short and data to track my progress is right at my fingertips. Streaks is not the kind of app I use every day, but it's there when I feel like I could be doing better in some aspects of life and want to keep myself honest by tracking my progress. Sometimes a few reminders and an objective view of your progress is precisely what you need to stay on course with your goals, which is why I added Streaks to my Home screen on New Year's Eve. Streaks is available on the App Store for $3.99.